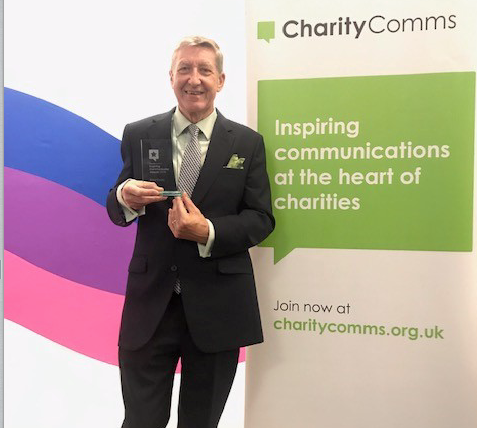 ST. Luke’s Hospice is proud to announce that their volunteer and Lead Ambassador Peter Eates has been awarded the ‘Charity Comms’ Inspiring Communicator Award’. Peter was given this prestigious national Award in London by Charity Comms Executives in recognition of his tireless work in raising awareness of St Luke’s Hospice. Peter, who lives in Chafford Hundred, has been associated with St. Luke’s Hospice since June 2016 as a Fundraising Volunteer and soon after became a Hospice Corporate Partner. This led to him supporting the Hospice by inspiring corporates, and members of the community to help in any way they could. Peter wanted to create an even greater impact, so working with Hospice staff Peter put together a ‘model’ to recruit, train and manage volunteer Ambassadors aimed at championing the Hospices work in the community. Peter now in his role as Lead Ambassador runs this amazing group of volunteers. Marilyn Debattista, Head or PR & Marketing at the Hospice, who nominated Peter for the award said: “Being named as an Inspiring Communicator means you have the passion and creativity to make others stand up and take notice, and to spur those around you to strive for more.